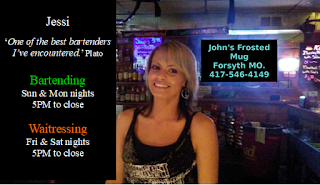 Forsythbiz: Bartenders! What's with them? Forsyth MO. - I used to never give much thought to people involved in the service industry. They're self-employed and appear in my world as servers at restaurants, hair cutters at saloons and as bartenders at bars! So, what was the big deal? Well, the big deal is that these hard working men and women generally are on their own in the business world. Their wages are often at or below minimum wage. Lots of times they get zero health benefits and no pensions. In other words, they are pretty much hung out to dry and depend heavily on tips to even survive. Were I in a position of power, I'd change that paradigm in a heartbeat. As it is, I can only tip well and try to promote a few select and deserving souls. Jessi is one such very deserving woman. See her at John's Frosted Mug in Forsyth MO!